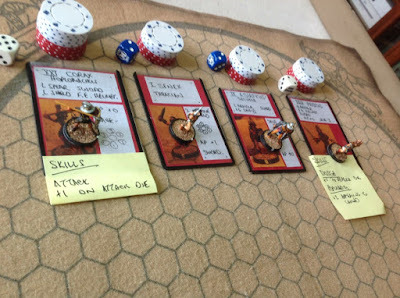 The first campaign we played was Leptis Magna, the second Antioch, and for the third, the Leptis Magna storyline was re-visited and continued with a new pair of gladiators. I was the "games master", and Mark was the "player" using his miniatures and conducting the fights. It was played to a conclusion in about 2 months between July and September 2016; all communication was via email. SENEX - Thracian; (sword but gladius not sica), small shield, light armour. ASIATICUS - Secutor; sword, large shield, light armour incl no helmet. For the Lanista to make a reasonable return on a gladiator, the gladiator needs to repay an amount of 100 gold aureus to the Lanista. This is repaid from a gladiators share of the winnings. Extra money can be earned in side activities. Depending on how the story goes, the Lanista might also sell the gladiator to another Familia. Or the gladiator could win the rudis and be freed! This becomes most likely if a gladiator makes it in gaining five skills. It is said that mystics predict Leptis Magna will one day be a great city, and a son from it will rise to become emperor. But this is not the situation today. The hapless magistrate, Lucius Septimus Geta, presides over a city torn by hatred and rebellion. Armed gangs roam the streets where no one is safe. Just recently, a lanista named Mettius Ulpius Noctua was murdered by such a foul gang. It is said that in the same night another lanista, Servius Albius Macer mysteriously left the city to join with his powerful relative, Lucius Clodius Macer, Legatus of the Legio III Augusta. Some say he was fed up with the lawlessness, others say he went to the protection of the legion as the Magistrate was going to move against him. With Vespasian no longer governor, having been sent to Judea to quell a rebellion, the power in Africa is now held by the Legatus. With so many gladiators up for sale, a number of astute purchases were made by Androcles, said to be from Corinth. He is a recent arrival who has decided to set up a ludus in Leptis Magna, occupying the former training grounds of Macer, which were declared forfeit by the Magistrate. 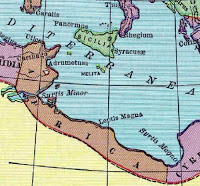 Such is that fate of Senex and Asiaticus that they were brought to Leptis Magna by Noctua, and now find themselves the property of Androcles. Both gladiators can buy their freedom if they earn enough money, and it is rumoured that some have done this. Or they can win freedom with the wooden rudis. Senex is to fight Corax, who has 1 skill. Asiaticus is to fight Priscus, who has two skills. The photo below shows the starting lineup. 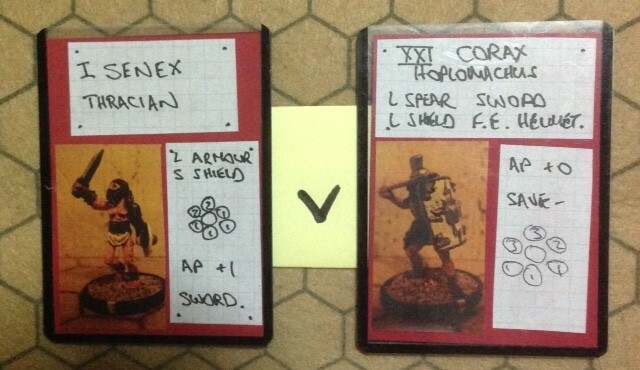 Notable that three of the four fighters got Strength scores of '2', the exception being Corax who scored '5'. I will admit I made my gladiators use blue MOAB dice and the opponents use the dreaded white MOAB dice in the hope of improving my chances. How that worked out, you can read below! This was the first pairing to take to the arena. I gave Corax the "Attack" skill as you can see. However as the fight developed it was Senex who did most of the attacking, causing some damage but with little real effect except to build up his fatigue. Corax cleverly kept parrying and retreating, waiting for the right moment while preventing any chance for Senex to work around a flank. Eventually Senex scored a 'double 5' special event and Corax lost his shield. At this point Senex stood on the shield and let most of his accumulated fatigues dissapate. He took one risk too many though, as Corax achieved a long awaited '6' AP score and was able to attack Senex's unshielded side. The modified attack ended up as potentially 6 damage and Senex failed to save. However he scored well on his appeal to the crowd, having both caused and suffered wounds, and was granted Missio. Quadratus, fuming on the sidelines, was heard to mutter about these utterly hopeless new fighters he was expected to train, and that the sooner they became lion food the better. It was obvious from the start of this fight that Priscus was a show-off (having the Popularity and Dodge skills), what with the fancy armour and not carrying a shield, but he also went straight into action while Asiaticus advanced more cautiously. The crowd expected pizzazz from Priscus and he delivered! Initial clashes were indecisive, but then Priscus, showing off a clever move, lost his sword. Over the next several moves he engaged Asiaticus in a clever cat and mouse game, tempting Asiaticus to move away from the weapon in the hope of striking a lethal blow, but then parrying and edging around to reclaim the weapon. 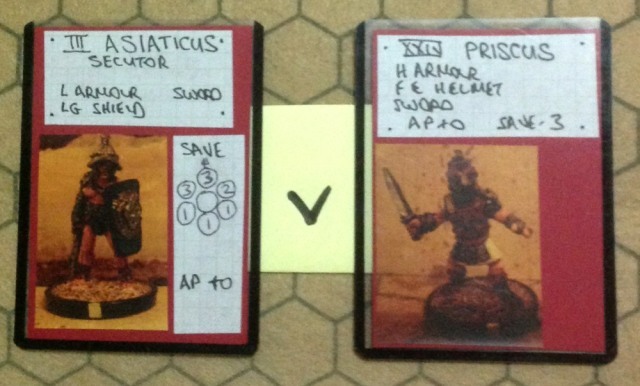 This included surviving three attacks by Asiaticus on his rear hex! That Dodge skill really paid off. The crowd was on its feet going wild for the favourite, and then ... he lost the sword again. Asiaticus kept doggedly following Priscus and attacking, unspectacularly but relentlessly, eventually taking him down to 'exhausted' status with only a single strength point left. Priscus never was able to repeat his earlier brilliance and retrieve his sword after the second loss. 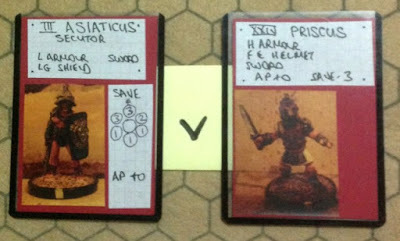 In the end a short run of poor AP dice meant Asiaticus could complete the job. Another attack from the rear succeeded this time, with a massive +7 modified score, killing Priscus outright with no chance to test his Popularity skill.